The report for this project has recently been released, you can download it here Final Report (PDF). In this project, an Australian team of clinicians and academics from nursing and paramedicine aimed to evaluate the effectiveness of eye tracking technology for improving feedback and developing situation awareness (SA) following simulated emergencies. Our objective was to pilot test the use of Tobii eye tracking glasses/software with cohorts of student nurses and paramedics. Students from Monash University, Latrobe University and The University of Queensland individually attended a two hour educational program which included three medical scenarios where a patient actor simulated a deteriorating patient. The video recording eye tracking glasses were worn whilst they attended to each patient and recorded their field of view and the track of their right eye (which is seen as a moving dot on the video screen). This technology enabled the teaching team to replay the video record to each participant immediately after each scenario, allowing them to reflect on their performance with particular reference to their focus of attention (known as their ‘Area of Interest’ – AoI). Educators were also able to provide immediate feedback with the consequence that performance increased significantly as the scenarios progressed. 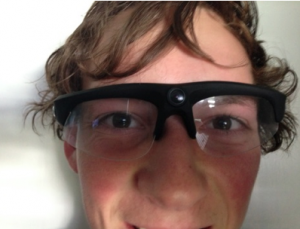 Software provided with the glasses also produces output such as ‘heat maps’ and ‘gaze patterns’. In addition, the researchers were able to designate their AoI, for example ‘the patient’ or the ‘monitor’, so that the time spent looking at each area could be compared within and between groups in relation to overall clinical performance. As the project progressed, the team also became particularly interested in how students’ communicated with the patient which was measured using a patient rating scale, but also with the use of ‘point of view’ video glasses that were worn by the patient. These glasses do not track eye movement but video record the view from the central stem of the glasses. In this website you will be able to access a variety of resources that will inform educational development in the field and assist in the technological aspects of eye tracking and ‘point of view’ video equipment. 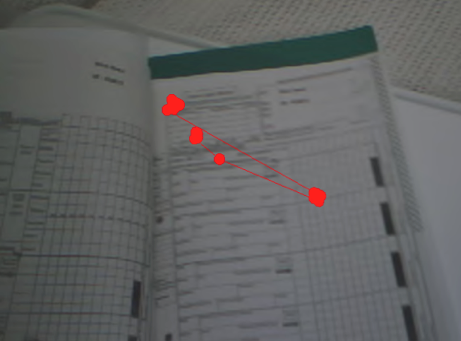 Example of a heat map showing a paramedic’s focus of attention in the first 5 seconds of entering a room i.e direct eye contact with the patient.